Travel – Landscape – Wildlife – Cycling – Skiing – Photography – Tutorials – Fabulous Outdoors Blog sharing the passion for the outdoors! Although Dji Global came out with a new drone called Mavic Air, the Dji Mavic Pro is still a great product to buy in 2018. We’ve compared the specifications of both, the Mavic PRO and the Mavic Air, and for the use that we intend to do, the Mavic PRO just seem to be more appropriate. It’s built and feels very solid, the foldable propellors are great for travelling and are less likely to break in small impacts, and the price has dropped since the newer Mavic AIR came on the market. It’s recommended to get the bundle deal with two extra batteries, the multiple chargers and the nice bag that goes with it. We’ll be making more videos on this channel Fabulous Sport Outdoors about how to fly a drone, video tutorials, filming tips and tricks to help everyone interested in these fabulous devices, and in photography / filmmaking. P.S. : I’m an ambassador affiliate with Dji Global, by using these links, nothing will affect your purchase, but I will earn a small commission from the company, and that’ll be much appreciated as it helps to cover part of the cost and the time of making these video tests and reviews. Mant thanks. Thank you for passing by and reading this post, if you have any question, don’t hesitate to get in touch and remember to.. GET OUT MORE as it’s.. The Osmo Mobile from DJI, the world leader in creative camera technology, it’s an extension for smartphones that turns them into intelligent, precision camera systems. Using DJI’s signature three-axis gimbal stabilization and SmoothTrack™ technology, the Osmo Mobile enables smartphone users to shoot effortless, high-quality photos and videos on the go. In combination with the DJI GO App, cinematic photos and videos can be live streamed or shared instantly on various social media channels. DJI’s ActiveTrack function allows users to simply tap the screen to automatically create perfectly framed shots of objects in motion. Users no longer have to choose between directing a shot or taking part in it. And remember to.. GET OUT MORE as it’s..
We have been using and testing a few Dji products in the past, and we’ve always been more than happy about the quality, durability and performances of their products. The Mavic Pro has been a fantastic travel companion, very portable and reliable, and able to produce fantastic footage, such as in this video here below. That doesn’t mean that the MAVIC PRO isn’t good anymore, it’s still a great product and the price is still very competitive. You can even get the MAVIC PRO ALPINE WHITE COMBO and it’s an awesome bundle deal at the moment. The Mavic Pro has been out for a while now, so people have been able to use it and test it to it’s full potential, however those few who have complained about their user experience, were often making mistakes in the way they were operating it. Anyway, with the release of the new MAVIC AIR, Dji realised the most portable Dji Drone to house a 3-axis mechanical gimbal with it’s angular vibration range reduced to 0.005 degrees. Set in a triangular formation, gimbal dampeners help create even steadier shots. The Mavic Air’s onboard camera integrates a 1/2.3″ 12-megapixel sensor and and f/2.8 lens with a35mm equivqlent focal lengthof 24mm to shoot high quality photos and videos. Plus, in addition to Horizontal, Vertical and 180degrees panoramas, the MAVIC AIR stitches 25 photos together in just eight seconds to create crystal clear 32-MP “sphere panoramas”. 4K 100 MBps to capture every second with UHD quality. SLOW MOTION VIDEO: with support for recording 1080p @ 120fps slow motion video, the MAVIC AIR captures all you epic high-speed adventures. HDR PHOTOS: New HDR algorithms help you obtain the right exposure settings intelligently, according to lighting conditions. Overexposed and dark areas are processed for more natural transitions between highlights and shadows. 8GB INTERNAL STORAGE: In addition to a Micro SD card slot, 8 GB of internal storage let you save photos and videos directly to the aircraft and export files through it’s USB 3.0 Type-C port. 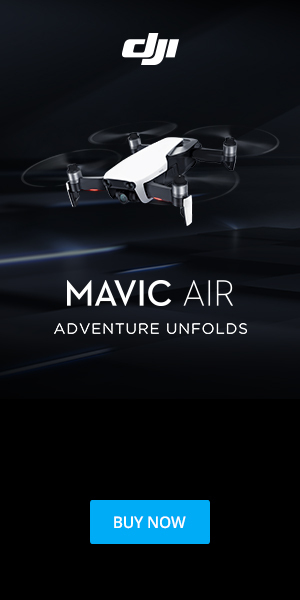 The geometric elegance, with the arms folding flush against it’s aerodynamic chassis, the 7 onboard cameras for obstacles avoidance, a fantastic foldable design, with a foldable remote control, make this Mavic Air becoming your best travel photography companion. We’ll be posting an outdoor test and operational review of it, so.. STAY TUNED! Thank you for passing by and for reading this post, you’re welcome to SUBSCRIBE TO THIS BLOG or to the Fabulous Sport Outdoors Youtube Channel and remember to..
GET OUT MORE as it’s..
A first quick look at the “Zhiyun Smooth Q” gimbal stabilizer for smartphones. Powered by a built-in rechargeable battery, the Smooth-Q not only supports an ultra-long continuous runtime up to 12 hours, but further backs up for extended mission allowing connection with portable power source through USB port. Saving your time and load with a super compact construction of only 440g, with it, now you can really travel light without missing a single moment on the road. A great product that will help you improve your video footage on the go. Thank you for passing by and reading this post/review, you’re welcome to SUBSCRIBE and FOLLOW. Remember to FET OUT MORE as it’s..
A GoPro Hero 5 Black video footage filming a mountain river water flowing filmed at different frame rate to show the difference in the video resolution quality. Original audio sound with the camera in the GoPro original case, which always decreases the quality of the sound. I’ll be posting a video tutorial in how to record better sound with your GoPro, tips and tricks to get the best out of this fantastic little action camera and to improve the quality of videos, filmmaking and documentaries. Get your GoPro at Amazon. Played back at 30 FPS as standard Windows Movie Maker settings and then slowed it down or speeded it up. Hope you’ve found this useful, for any more informations, you’re welcome to write a question in the comment section here below the Youtube video, or in the blog post. Thanks for watching, you’re welcome to LIKE the video by pressing the button below, SUBSCRIBE to the channel Fabulous Sport Outdoors and to follow on any other social network platform we are in. Testing out the GoPro HERO 5 Black 4K Video Moving Time Lapse Hyperlapse – captured in Bozel, a beautiful mountain village at the beginning of the Val Vanoise National Park, in the Tarentaise, Rhone Alpes, Savoie region of France. This review will be completed as soon as possible, you’re welcome to subscribe to the blog to be notified about new articles posted. If you have any questions about this product, you’re welcome to write in the comment section below. After numerous frustrating attempts to connect my old Garmin Edge to the Garmin Connect website, I was after a different bike computer that provided a similar amount of data and functions. I was then recommended to take a look at the Wahoo products, and here’s my first thoughts on the Elemnt computer bundle. I’m not particularly a fan of the unboxing reviews, but this time I was pleasantly surprised on the packaging design and descriptions. The package unfolds giving you a quick idea on all the functions and the different screen displays that you can then customise, but more about that later. The box opens like a drawer where the device rests firmly inside a molded cover. Once the cover is removed, you’ll find the “Quick Start Guide” booklet that basically tells you to download the App and to synchronise it with your smartphone. In the bundle package, you’ll have the cadence sensor, the heart rate monitor belt, a speed sensor, different bike handlebars mounts, and the charging cable that I was very pleased to see is a commonly used micro-USB rather than a original different one that I’ll end up losing or forgetting at home when needed. It’s interesting to see how nowadays there seems to be less informational booklets, but instead the manufacturers send you to either a website page, a video or a phone app like in this case. Most of the settings, syncing and connecting has to be made via the mobile app, which is surprisingly easy and straight forward. I like the fact that you can have as much or as little information on your screen. With a simple click on the button on the right, as shown in the photo above, you can zoom in or out, and by doing so the display shows more or less information to read as you cycle. I’ve chosen to start by reviewing the Elemnt prior to the newer Elemnt Bolt as it’s slightly bigger, so for navigation purposes as a tour guide, it’s an advantage over the smaller one. It comes with 3 different mounts, so it can be mounted on the handlebar stem or in front of it, whichever way suits your preference. Anyway, it’s now time to go and test it on the road. You’re welcome to subscribe and follow the blog to see how it goes. Thank you for passing by and reading this review, I hope you liked it and, if you need more information, don’t hesitate to get in touch.